We have been wanting to try Snow Dragon Shavery (2618 N. Clark St., Chicago, IL 60614) for a long time. Their Technicolor treats have been blowing up Instagram for a while, and everything there looks so darn delicious. However, what we are really there for is the Taiwanese shaved snow ice, an enigmatic creation that is becoming more and more popular stateside. The inside of Snow Dragon is bright and colorful, and it is open super late – Midnight on Friday and Saturday – for all of those late-night ice cream cravings. You can pick your flavor of snow ice, one sauce and two toppings. Flavors of snow include traditional, vanilla, tutti frutti, key lime, mango and coconut and there was a complete toppings bar with fresh fruit, boba and candy. The combinations are nearly infinite but we settled on matcha green tea shaved ice, topped with mango sauce, fresh strawberries and chocolate chips. The texture of the snow ice is really unique, and almost seemed like flaky, layered sheets, which melt instantly in your mouth. Unlike a snow cone, the shaved snow also has more of a creamy taste and texture. The menu at Snow Dragon is huge, and there is pretty much every type of icy treat you could want including a selection of FroYo, a rainbow of exotic macarons (think Ube and Passionfruit) ice cream, bubble tea, Indian kulfi popsicles and more. Perhaps the most notable (and photogenic) offering – other than the snow ice – are the overstuffed macaron ice cream sandwiches! We look forward to getting back to Snow Dragon to sample more of their eclectic, icy treats. And we even hear they now have an outposts in Navy Pier and Evanston! Phusion Cafe (3030 W. Superior Ave, Cleveland) is where we ended up instead when we thought we had arrived at Superior Pho. The first time we turned around in confusion, but this time we were excited to give the only place for Taiwanese food in Cleveland a try. If you enter from the back parking lot you will be greeted by the jumble of signs below. Phusion’s location in the lobby of a mini mall is not necessarily the most atmospheric, but don’t let that (or the vague name) dissuade you from some amazing Taiwanese food! The menu at Phusion has a large selection of typical some American-Chinese favorites like Egg rolls and General Tso’s chicken, but we made a beeline for the selection of more unique Taiwanese dishes. The server was more than happy to describe the Taiwanese dishes and offer recommendations. We were interested by the unique Taiwanese dishes including Hakka-style pork and squid ($12.95) and the Hakka-style tofu ($10.95) along with perhaps the most famous Taiwanese dish, Three Cups Chicken ($12.95). To start off, our server recommended the salt and pepper chicken, we got an appetizer portion, though you can also get it as a full sized entree. M ordered the ginger beef ($12.95) and L got the cold peanut and sesame noodles ($6.95). These cold noodles were the first Taiwanese dish we ever had, all the way back in Minneapolis, so seeing them again on the menu made us feel nostalgic. We only waited a short time for our food even though the dining room was pretty full with groups of college kids chatting and sipping on bubble tea. The salt and pepper chicken was crunchy, not greasy and actually consisted of high quality chicken (kind of the opposite of what we usually expect from popcorn chicken). The beef in the ginger beef dish was tender and flavorful, and there were actually long strips of ginger root throughout (we love ginger so this is a major plus). However, the favorite of the night was the delicious cold noodle dish topped with cucumber. The noodles were rich and savory, and the mix of peanut and sesame made for an incredible sauce. We could eat this every day! And, yes, they have bubble tea! Not only that, it is made with Ten Ren Tea, a brand known for their high-quality leaves. Has anyone tried the bubble tea there yet? Phusion Cafe makes an excellent addition to an area where Taiwanese food is lacking, and delivers with authentic Taiwanese flavors. Our visit definitely made us want to duplicate that sesame and peanut noodle recipe at home. We are always up for a new kind of iced treat, especially the international varieties – gelato from Italy, halo halo from the Philippines and the wave of frozen yogurts from Korea – all delicious. So add to the list Xue hua bing – an icy confection from Taiwan. 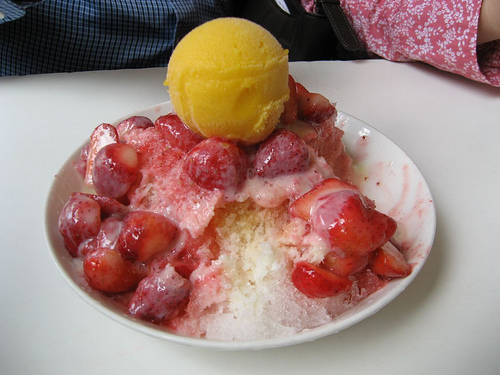 The name translates to “snow ice” and is a mixture of milk, ice and fruit, and each serving is shaved off of a giant ice block, and topped with fruit and other confections. There used to be a dedicated spot for Xue hua bing in Chicago – Cloud 9 on Belmont – though it has been closed for a while now. So we were excited to learn about Snow Dragon Shavery (2618 N Clark St, Chicago, IL 60614), which has taken up the torch as the only dedicated XHB spot in Chicago. I love learning about unique foods from around the world, especially if they are a little quirky. One of the quirkiest foods I have encountered recently is honey toast, a Japanese creation that has caught on in Taiwan, where the topping choices have become even more extravagant. Honey toast is composed of a small loaf of hollowed out white bread, the interior of the bread is cubed, toasted and stuffed back inside, and all is covered with a heaping helping of honey. Honey toast toppings may be a simple as ice cream, or may include fruit, syrups, or even something as decadent as macarons. Curious yet? A review of What8ver Cafe in British Columbia has a great description of honey toast. Or if you need a better visual, here is a video of Honey toast at Dazzling Café in Taipei being dissected. Making the honey toast does not seem terribly difficult, but definitely for carb lovers only. Now that Cloud 9 in Chicago is closed, and Spring is theoretically around the corner, where can you go for you Xue Hua Bing (Taiwanese shaved ice) fix? 527 Cafe! Right in downtown Evanston (527 Davis St.), Cafe 527 makes some pretty good XHB, with gargantuan portions. The flavors available are mango, strawberry and passion fruit and the serving size is more than enough for you and your 2 closest friends.